BN and JCC President Carmen Weinstein deeply regret to announce the passing of Mrs. Denise Moreno, daughter of Adolphe and Suzanne Gani. 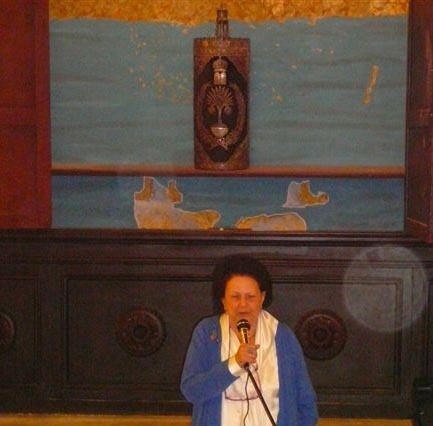 "I first knew Denise through hearsay from her mother before she left Egypt to join her daughter in Paris," recalls Carmen Weinstein whose own mother, the late Esther Weinstein, was a personal and intimate friend of Suzanne Gani. 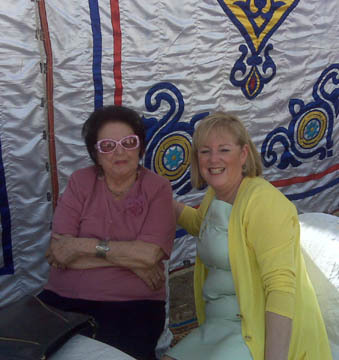 "When Denise came to Cairo after her mother's death, she looked us up, my mother and myself, and since then never lost an opportunity to remain in touch." Weinstein recalls how one of Denise's first requests was to visit Bassatine Cemetery. Both shared the view about keeping the cemetery in shape and preserve therewith the sanctity of the dead (see BN Issue 15). "She never failed to send donations for that purpose, the last being at the beginning of this year, with her son Claude," says the much chagrined Weinstein. 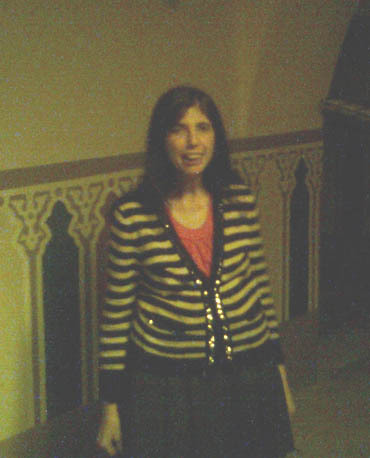 "It is sad to see this last generation of Egyptian Jews depart, especially those, like Denise, who still cared about our JEWISH HERITAGE. Equally sad is that the younger generation, with very few exceptions, are so completely indifferent to their ancestor's history." Denise Moreno was buried on Wednesday, 23 June 2010 in the Pantin Cemetery, Seine-St-Denis, Paris. The JCC and Bassatine News applaud Minister of Culture Mr. Farouk Hosni and Supreme Council of Antiquities Chairman Dr. Zahi Hawass for their undertaking of the restitution of the Maimonides complex; special thanks to the Minister of Interior and the Cairo Governorate for providing exceptional security and logistics arrangements during the re-dedication event. And to all those who took part in the restoration of this venerated landmark we are forever in your gratitude. and last but certainly not least, to extend their warmest thanks to the valued sponsors of this milestone occasion. Me voici de retour � Gen�ve, dans le froid et la grisaille. Comment vous remercier pour cette merveilleuse c�l�bration que vous avez organis� ? Ce sera pour moi un souvenir qui restera grav� � jamais dans ma m�moire avec, en plus, le plaisir de vous avoir connue ainsi que votre soeur que j'esp�re revoir un de ces jours � Gen�ve. Votre sourire nawwarna el yom wal sana kollaha ! 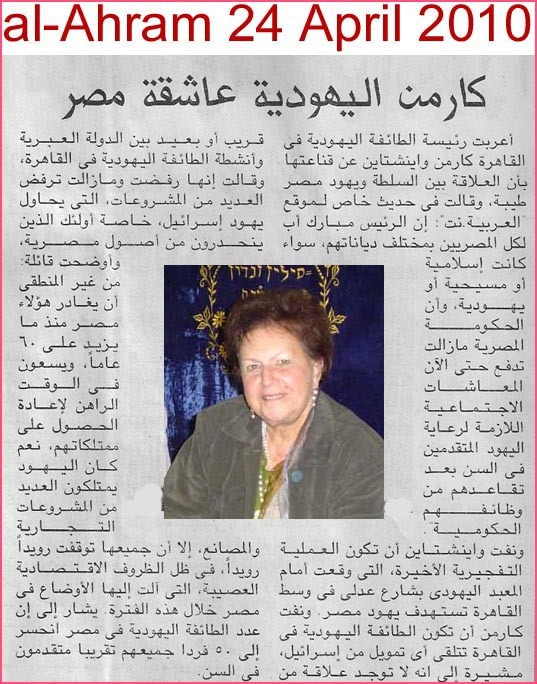 I am really proud of representing Casa Sefarad in Egypt. Congratulations for you excellent organization and thank you very much for your warm friendship. I hope we can find more chance to cooperate. Congratulations for the big event of the Reconstruction of the Rabi Moshe Temple. I was very happy to read about you in the article of Anis Mansur and also your beautiful performance with your blue dress as smadar wrote in yediouth ahronot.  I wish you best wishes and hope to see you soon .I'd like to take advantage of this moment and wish you happy Passover. I hope you have managed to get some well deserved rest after the excitement of the rededication ceremony and the festivities surrounding it. I am back in London but my spirits remain high in the clouds after a very emotional few days where we witnessed a miracle of a Jewish shrine abandoned and derelict comes back to life and stands as a symbol of our heritage and legacy as well as a reminder of the 1,400 years of harmonious and productive partnership between Jew and Arab. 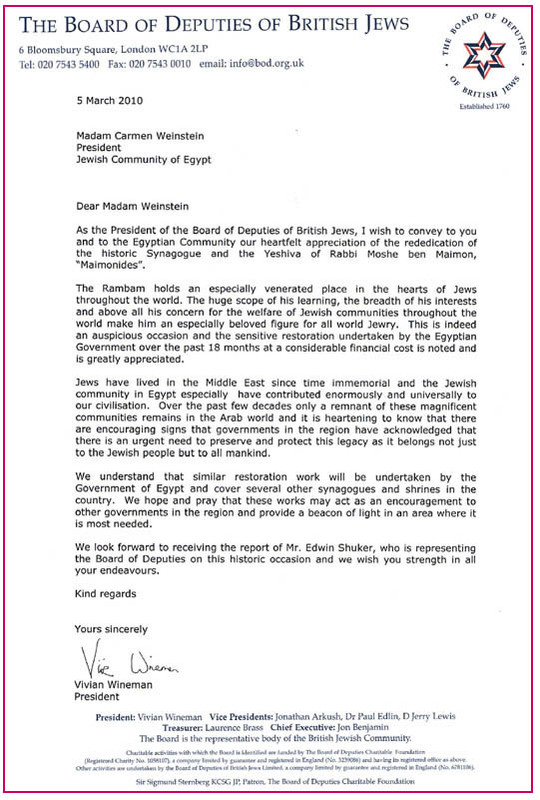 I attach a message from Mr Vivian Wineman, the president of the Board of deputies of British Jews which I carried with me to the festivities but did not deliver as planned. I also had a personal message to express what the events meant to me personally as a Jew from an Arab country to share with you this miraculous achievement. I look forward to my next visit to Cairo in May and look forward to meeting you on happy occasions and in good health. We are back in London in one piece.I am sorry that I did not have a chance to say goodbye to you as I did not attend the last dinner. Thank you for organising the event so well & so movingly. At Bassatine purely by chance I found the tomb of my maternal grandfather Rafoul Bigio who died in 1943. Please confirm if you have received the contribution from the Maimonides foundation & keep me informed of any future events eg the restoration of Chaim Capucci & that of Nebi Daniel. Best wishes from my daughter Simone & her husband Ayhan Dawood. I hope that you are well. Thank you for an amazing three days in Cairo. They were truly memorable. I learned so much and enjoyed myself also. I have spoken with Lord Janner about the event and I understand that he called you to wish you Mazel Tov. I have also let the British Ambassador know about the event. He was unable to attend because Tony Blair was visiting but his office should be in contact with you. I would like to thank you again for the great work you did and the moving experience you produced. About those who criticize, you may tell them "ya 'awaazil falfilu". I am sorry to hear that the press inauguration was cancelled. 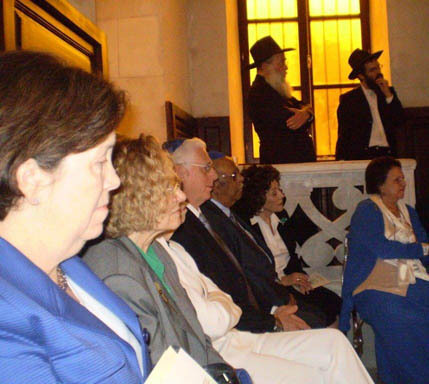 I trust though that the private rededication ceremony held by the Jewish community last week was quite heart warming. It must have been so joyful to hear the sound of the shofar. Please accept my heartfelt mazel-tov. 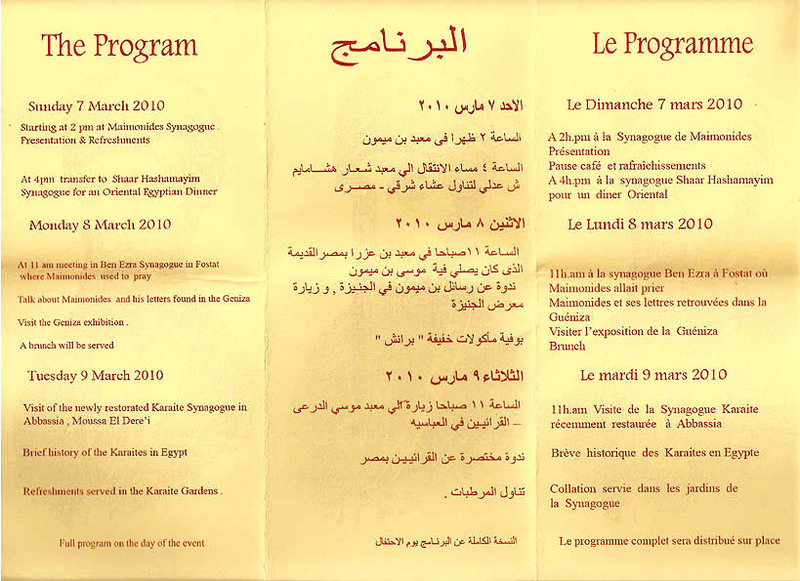 I personally congratulate you for all your efforts that you are giving to the Egyptian Jews history. 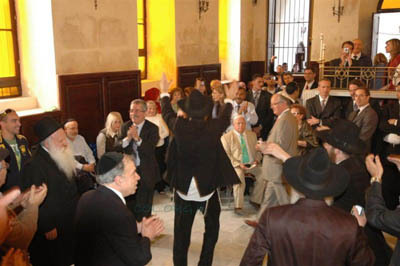 I wanted to be there to celebrate the restoration of Rab Moshe Synagogue (HARAMBAM) but due to some medical problems, I was not able to attend. I wish all the succeed and god bless you all. Thanks for all. Since I came back to Paris, I have remained somehow connected with those days I spent in Egypt. I want to thank you very warmly for those days spent around the various celebrations which were very intense and interesting. 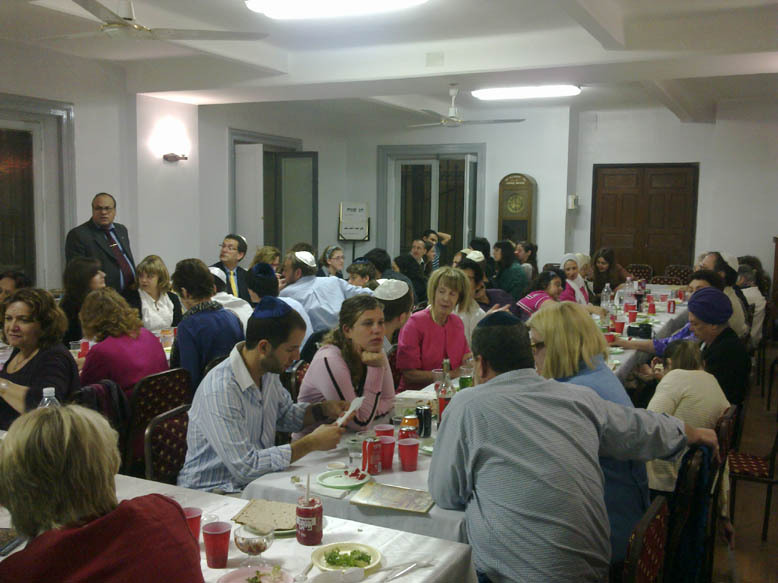 To thank you also for everything you�re doing to keep the memory of Egyptian Jews alive. I shall come back and hope I �ll be able to meet you again. 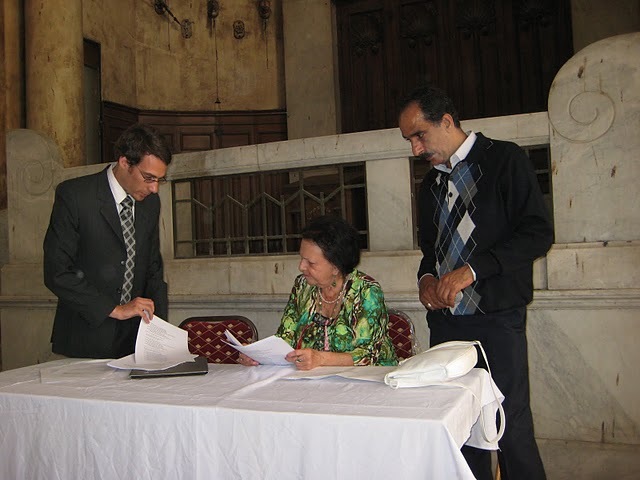 Carmen Weinstein in the Karaite synagogue perusing papers of speech by Peter Verkinderen of the Dutch Institute and Raouf Tewfik of the JCC. Rabbi Boruch Helman here in Boston has made me aware of your leadership in the efforts to restore the Moses Ben Maimon Synagogue in Cairo, as well as other remaining structures from the centuries of Jewish presence in Egypt. 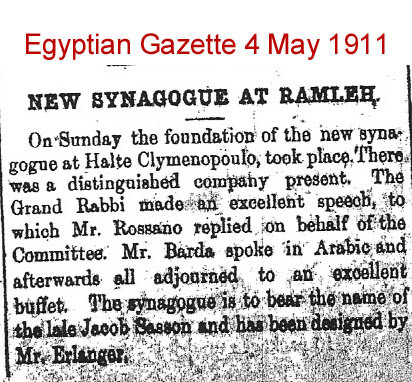 It is very exciting to learn of the upcoming re-dedication of the synagogue next month. I laud your efforts and want you to know that there is enthusiasm for these projects among my colleagues here at Harvard University and around the world. I would like to call your attention to an article that I published a decade ago in the highly respected medical journal, Archives of Internal Medicine. The article, titled "Moses Maimonides: Medieval Physician and Scholar" I have attached the article here as a PDF file. Please know that there is considerable international support for your restoration efforts, and I wish you strength and success in all those endeavors. 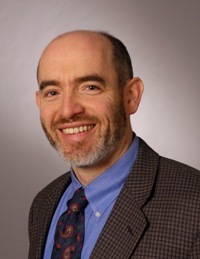 With kind pemission from Professor Steven Simon, JCC president Carmen Weinstein quoted from his valuable paper at one of her presentations during the March 2010 3-day Maimonides celebration. Egypt cancelled the inauguration of a restored synagogue on Sunday citing objections to Israel's treatment of Muslims in the occupied territories as well as alleged excesses during an earlier ceremony. Egypt's Supreme Council of Antiquities spent seven months restoring the ruined Ben Maimon synagogue in Cairo's ancient Jewish quarter and had been set to unveil it to the press Sunday, a week after its rededication in a private ceremony. Council head Zahi Hawass called off Sunday's event following criticism in the press of the synagogue's rededication ceremony, which was attended by Israeli diplomats as well the American ambassador. 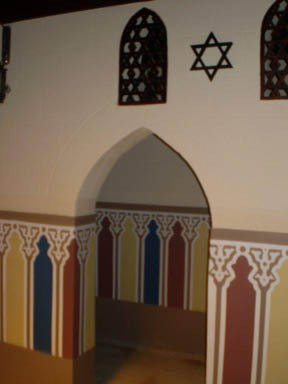 The cancellation was largely symbolic as the restoration is complete and the synagogue has been reopened. "This cancellation comes after what happened during the inauguration by the Jewish community who engaged in activities considered provocative to the feelings of hundreds of millions of Muslims around world, including dancing and drinking alcohol," Hawass said in the statement. He added that "Muslim sanctuaries in occupied Palestine are subject to aggression by the occupation authorities," citing in particular Israeli security actions on the Temple Mount, known as the Aqsa compound to Muslims, in Jerusalem. 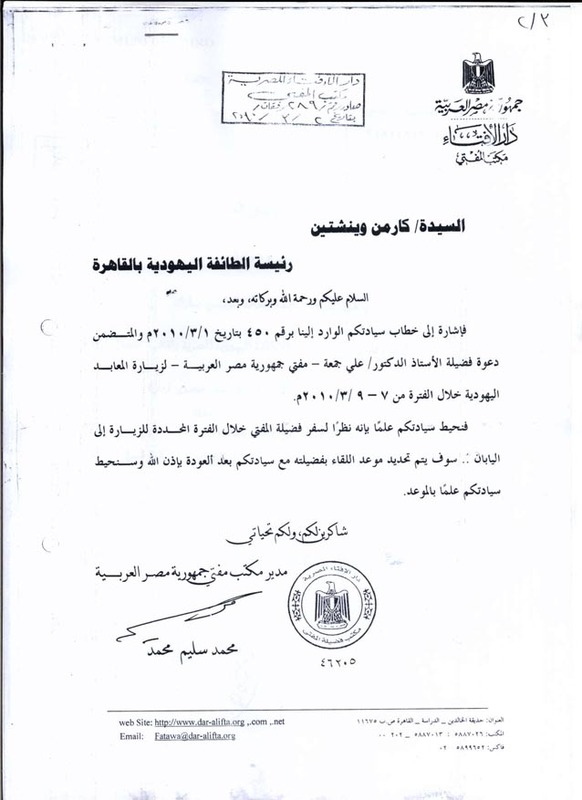 Officials with Cairo's Jewish community had no comment about Hawass' statement. 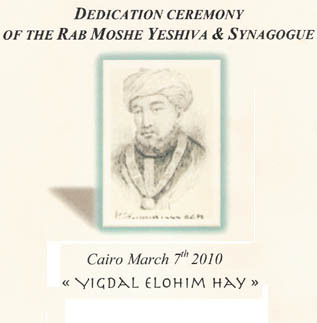 The March 7 dedication ceremony at the synagogue, named after the 12th century rabbi and intellectual Maimonides, was closed to media and included half a dozen Egyptian Jewish families that long ago fled the country. No Egyptian officials attended the ceremony. 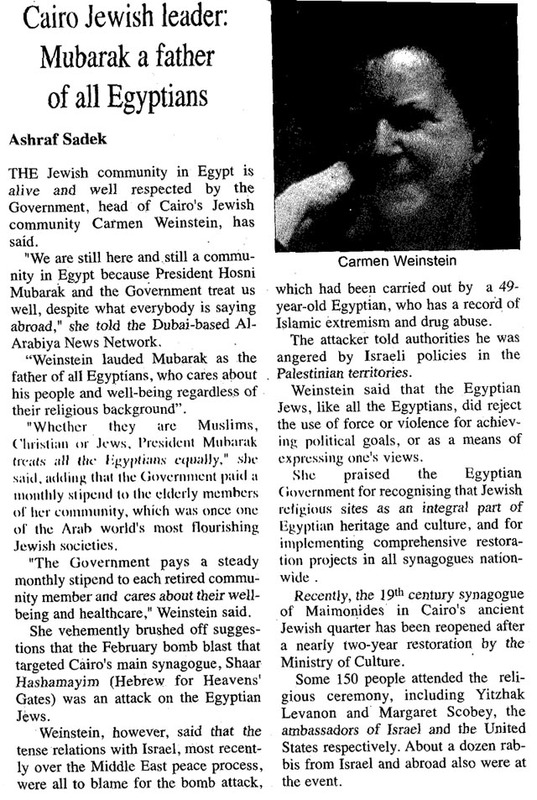 Egypt's Jewish community, which dates back millennia and at its peak in the 1940s numbered around 80,000, is down to several dozen, almost all of them elderly. The rest were driven out decades ago by mob violence and persecution tied in large part to the Arab-Israeli conflict. Egypt and Israel fought a war every decade from the 1940s to the 1970s until the 1979 peace treaty was signed. 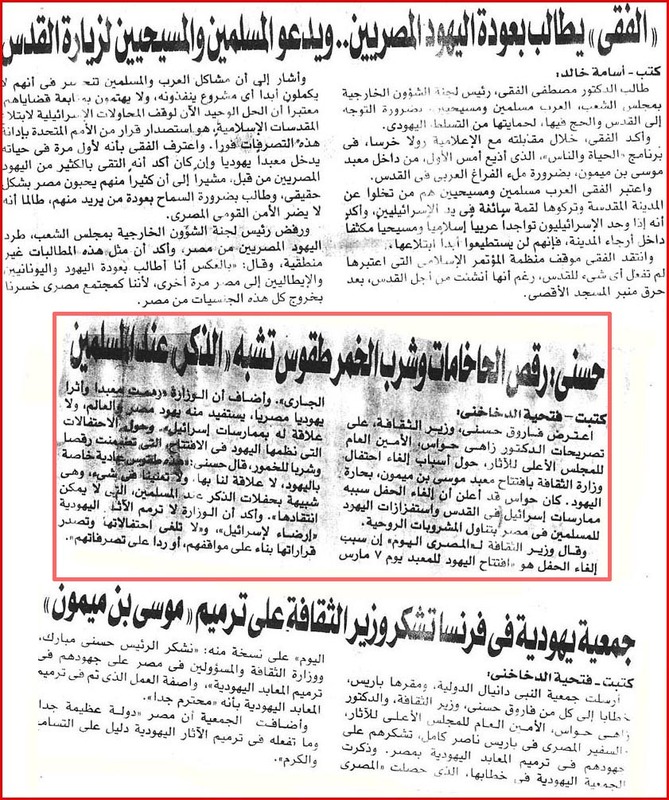 Despite that treaty, Egyptian sentiment remains deeply unfriendly to Israel, and anti-Semitic stereotypes still occasionally appear in the Egyptian media. On Tuesday, Culture Minister Farouk Hosny said his ministry was committed to restoring all 11 synagogues across Egypt, three of which have already been renovated. 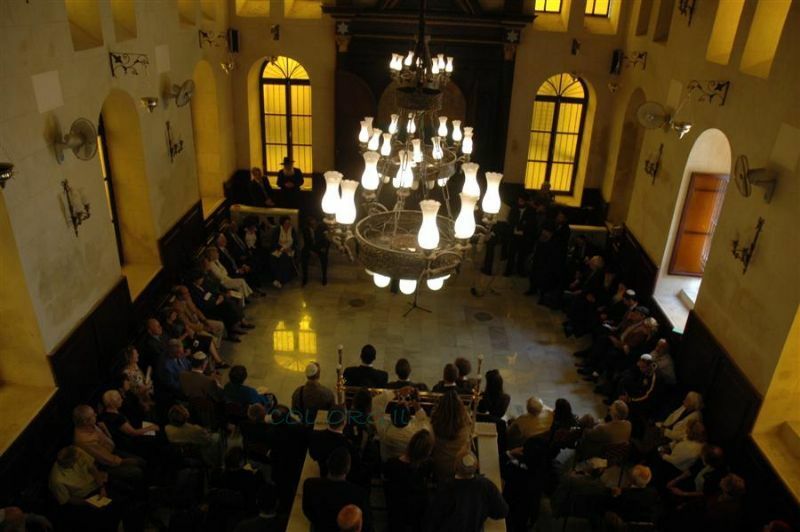 The best-known synagogue that of Ben Ezra, is located in Cairo's Christian quarter near a number of old churches and was restored years ago. 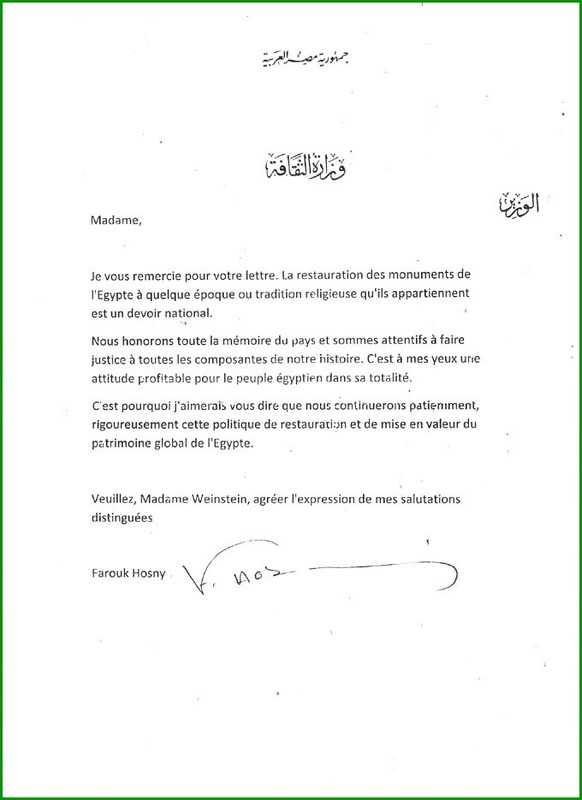 In his statement, Hawass lauded Egyptian efforts to restore its Muslim, Jewish and Christian sites without regard to their religion. "This is proof of the religious tolerance in Egypt, while Muslim sanctuaries in Jerusalem and other Palestinian cities are subject to destruction and sequestration by Israel," he said. 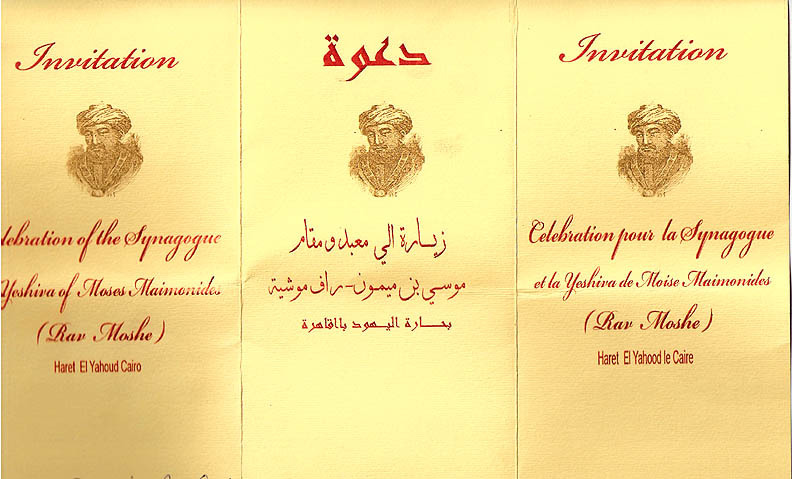 The official celebration marking the end of restoration work of the Moses Ben Maimon (Maimonides) synagogue located at the Jewish alley in old Cairo has been cancelled, announced Zahi Hawass secretary general of the Supreme Council of Antiquities (SCA). Hawass added that this cancellation came in the aftermath of the actions of Israeli authorities, who prohibited worshippers from praying in the Al-Aqsa mosque. During his answers to several journalists concerning this issue, Dr. Hawass said that Egypt is always keen to preserve and protect its archaeological and cultural heritage whether pharaonic, Islamic, Coptic or Jewish. Egypt�s devotion to preserve its monuments on its land is also reflected in Egypt�s inhabitants of different faiths (Islamic, Coptic, Jewish) living in a harmonious atmosphere. It is a message to the whole world that there is not any difference between the religious monuments and places whether Islamic, Coptic or Jewish. 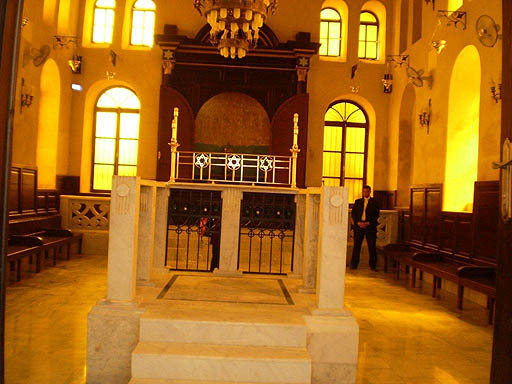 Dr. Hawass asserted that restoring the Moses Ben Maimon synagogue was carried out by Egyptian restorers and financed with a budget provided by the SCA with funding from there was foreign aid that helped finance the restoration. He also denied all rumors saying that the synagogue will be transformed into a museum for Jewish collections, as Egypt has a very small amount of objects, and they are part of Egypt�s larger cultural heritage. �These artifacts will be put on display in several national museums now under construction in different towns in Egypt,� said Hawass. 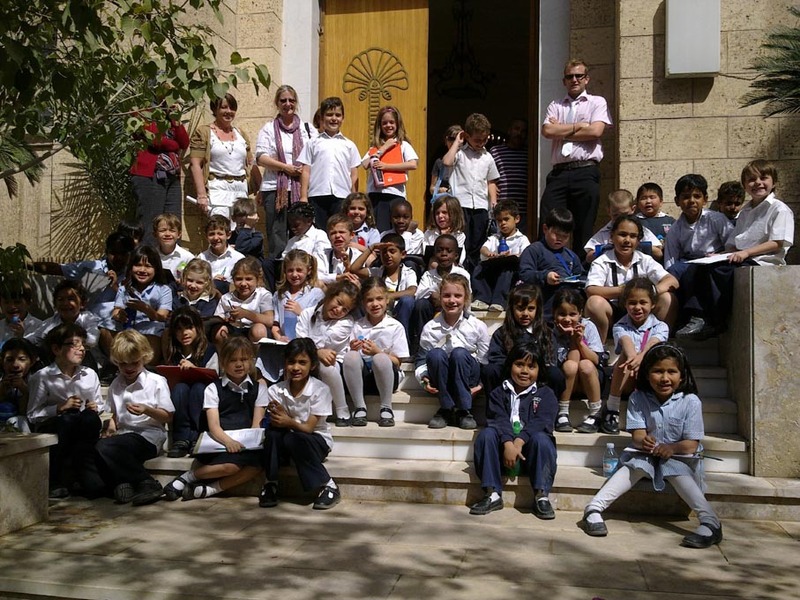 Keeping up a seven year-old tradition teachers and students from the British School made their annual visit to Maadi's Meyr Biton temple on 25 March to explore similarities among different houses of worship. Q. On the subject of synagogues, does anyone know anything about the one referred to below? The answer to the above question + photo was not late in coming from our overseas scholar-consultant Michele M.
A. 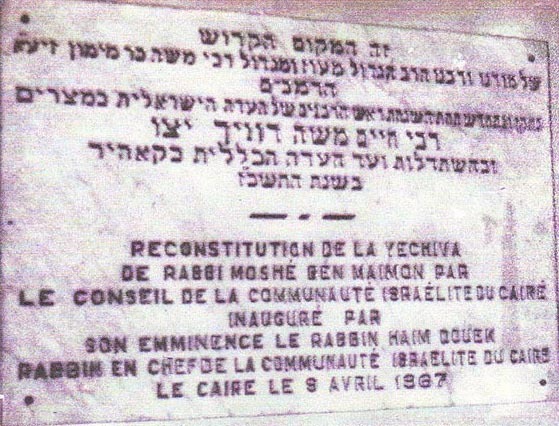 "J'ai retrouv� la synagogue. 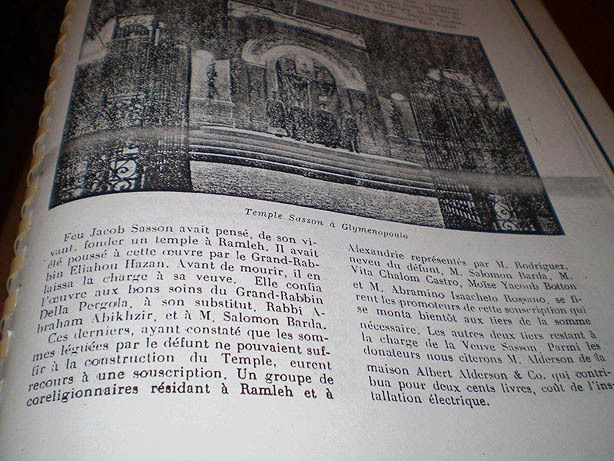 Elle est plus connue sous le nom de Temple Sasson car elle a �t� construite par la veuve d'un certain Jacob Sasson, auquel le rabbin Eliahu Hazan avait demand� de construite un temple � Ramleh. C'est le grand rabbin Della Pergola qui a supervis� la construction." 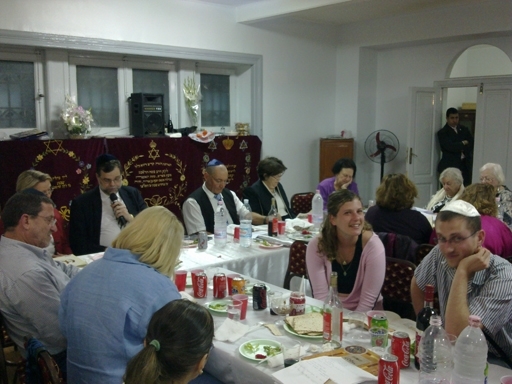 Like each year, the community celebrated Seder at Shaar Hashamayim Synagogue. Over 80 persons attended. We could have been 92 but unfortunately a group of 12 was delayed by their tour leader and did not make it. Among those who attended were Ambassdor Margaret Scobey of the USA and Ambassador and Mrs Thomas Nader of Austria. As we did not get a Rabbi or a Hazan, the consul of the Israeli Embassy, Jack Beja, was kind enough to join and volunteer to conduct the prayers. The community members felt cheered up when they found so many people joining them. I don't know why Jewish tourists choose to come either before or after our religious holidays. I hope they will some day decide to be here on feast day and join us. Anyway we send our greetings for a Happy Passover to all our friends scattered around the world. We also wish a Happy Easter to our Christian friends and a very happy Shamm el Nessim to all of us, the Egyptians.